Physter, RE: "order the death of someone who gathered sticks on the Sabbath?" I subscribe to a website, chabad.org, that explains the Jewish point of view - it may or may not surprise you, that they cover all electrical switches, not just wall switches, but toaster, Microwave, toaster-broiler, Crock Pot, Mr. Coffee, etc., with aluminum foil on the Sabbath, just to be sure they're not tempted to turn an appliance on. If you visit Israel, on the Sabbath one elevator out of a bank of elevators will be the Sabbath elevator. It continually goes up and down, stopping on every floor, so that they don't have to push the buttons. Usually the other elevators work normally, but if the other elevators are broken and you have to use the Sabbath one, you end up as a rather cranky Gentile. But no, I didn't know that about all the other electrical switches. If you have no access to your labor-saving devices, couldn't you potentially end up doing more work? Nope - you're supposed to do all that the day before the Sabbath. Now, you can begin a meal, before the Sabbath, in a Crock Pot, but to serve it, you cannot set it on the table, and pick it up again - you must hold it while you serve, and return it to the same spot from which you picked it up, otherwise, you have worked. Seriously, if you know me, you know by now I have a very wild imagination, but there's no way in hell I could ever make this stuff up. If you want links, I can certainly give them to you, but please don't waste my time if you're not going to go there and read them..
Jewish folks are in competition with the Amish for silly rules and creative ways of getting around them. For example, while the Amish say they can't use electricity, what they mean is they can't connect to the local electric grid. They can operate machinery they can run off a generator. They don't use cameras or allow photos of themselves to be taken. Why not? "Thou shalt not make unto thee any graven image, or any likeness of anything that...is in the earth..." (I wonder how many "Christians" disobey this very clearly stated rule, which is the second of the Ten Commandments. When an Amish woman dies, she is typically buried in her wedding dress. Now, there are shades of Amishness. Mennonites (related to the Amish but usually more extreme) are more puristic about it and are thus more strict. Some Amish make exceptions when away from home. If an Amish owns a store, for example, he may be allowed to plug into the electrical grid or use a car. What besides religion or schizophrenia can have people behaving so crazily? Which Mennonites have you been talking to? There's old order Mennonites that are like the Amish but less extreme, and then there's normal Mennonites who drive cars and have internet and can dance and all kindsof things. They just talk about peace a lot, have hang-ups about alcohol, and don't worship the government like many American protestents. But I do stand corrected anyway. 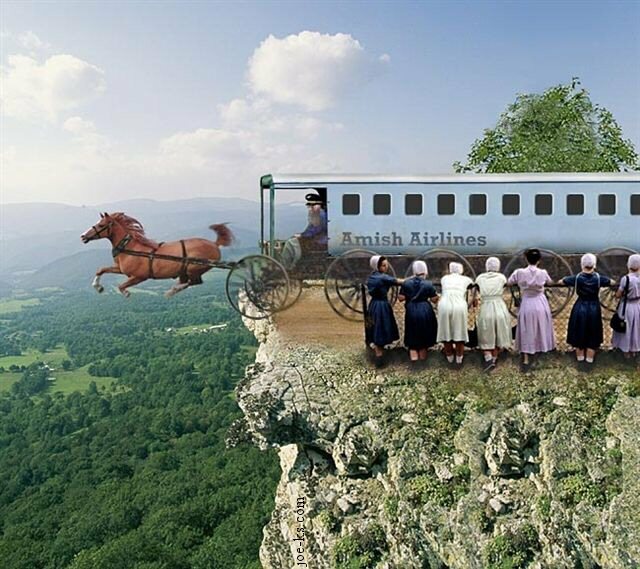 Amish Airlines: But what holds it up? Jesus? The link works for me. That's Goshen College, one of the Mennonite colleges. At college they're even more liberal, hence the pink mennos. I know some Jewish people, while observing the Sabbath, have a "Let a goy do it" philosophy ("goy"=non-Jew). For example, here in the Cleveland area, which has one of the highest concentrations of Jews in the country, there's a Jewish deli. It's open 7 days a week, but on the Sabbath it's operated by trusted goyim.